iCloud syncing (also known as “iCloud Sharing”) allows you to share preferences, configured connections, and even custom styles between multiple copies of Textual with little to no interaction required. In order to use iCloud Syncing, you must own a copy of Textual in the Mac App Store. If you have already purchased the standalone version of Textual and would like to use this feature, then contact us to receive a free promo code for the Mac App Store version. Enabling sharing is incredibly easy: Open Preferences (Command Comma) and enable Share data between devices using iCloud. That's it. Everything is handled automatically by Textual from this point on. Once enabled, Textual will ask iCloud if any other devices have anything to share. If they do, Textual will gather all the information that it can and synchronize it. This means that all connections and preferences shared with iCloud will be applied immediately in order to mirror all other copies of Textual. This mirroring process will not erase connections that are already exist. They will remain alongside those added from iCloud. Of course this assumes iCloud is available at the time that sharing is enabled. If it is not, then Textual will wait until it is available before trying to gather any information. Sharing is enabled, now what? Now that sharing is enabled, Textual will automatically synchronize its preferences with all other copies of the app that have sharing enabled. For example, if you changed the preference Toggle away status on display sleep, then this preference will also be updated on all other devices to reflect the change. The same also applies to configured connections. Adding a new server and/or channel or modifying one that exists means that those changes will be reflected on all other devices. Textual is not able to synchronize passwords at this time due to several technical limitations. What if I want to exclude a connection from being shared? 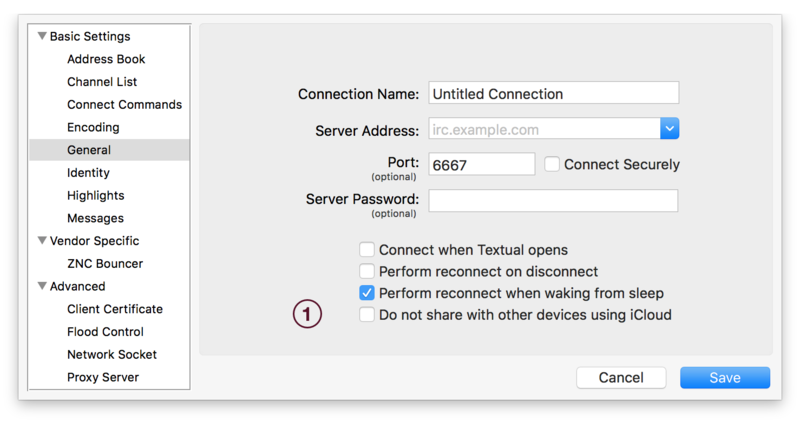 Textual provides a checkbox in Server Properties (Command U) for excluding a specific connection from being shared. What happens to my data when I disable sharing? The data stored on iCloud will remain there if sharing is turned off to allow for it to be retrieved at a later time. But wait, I use a custom style. What happens then? That is fine. Textual understands that not everyone likes the styles bundled with it. If you have a custom style in use, Textual will not try to override that unless you changed the style on another device being shared with. Additionally, if the style being shared through iCloud is custom and Textual detects that it was installed on another device, then that device will automatically refresh itself to use the newly installed style. How do I hide Textual's folder on iCloud Drive? Textual maintains a folder on iCloud Drive for the purposes of synchronizing custom styles.